Walking on eggshells, tip toeing around someone, wearing kid gloves and scared to say something that can be misunderstood, measuring each word before you speak and each action before you do. How many of us have been in such situations with different people? How many of us have been this person? I was recently reminded of this and then someone spoke about the very same thing. It’s the offence of taking offence. I don’t know about you, but I have been on both sides of the fence. I have been reflecting this in my own life and my life experiences. Here are some thoughts and observations. What is it that causes us to take offence? What should I do when offense is given? Why do I take offense? The bible reminds me often, not to think too highly of myself. ( Romans 12:3) I ought to on the contrary have a sober judgment or assessment of who I am and what kind of person I am in relation with others. I need to be humble and not expect everyone to treat me like the “Queen of Sheeba”. What should my view of other be? Well the Bible tells me in no uncertain terms to “think of others better than yourself” ( Phil2:3) I should give others the benefit of the doubt rather than jumping to conclusions about their motives , thoughts and behavior. Love always hopes, always protects, and always trusts. ( 1Cor 13:7) This ought to be my posture with everyone. One might argue that this could lead to false modesty. I don’t think the Bible is suggesting that in any way. I could be a better tennis player than my friend; however she could be good at something else so I can appreciate that in her. 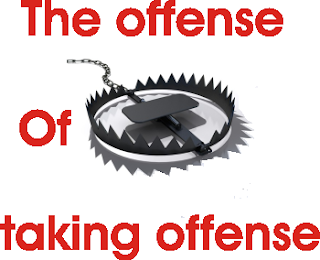 What about this offense thing? It’s basically putting a very high standard and having a high expectation from everyone else’s behavior, speech. It’s expecting others to be perfect while letting yourself off the hook on the same issues. The Bible talks about picking dust from one’s brother’s eye while we have a huge tree bark jutting out of our own. Another word for this is hypocrisy or a pharisaical spirit. When we behave like this we expect everyone to treat us with kid gloves. · Often these people are blind to their own faults while expecting everyone else to toe their line. · They are not open to any feedback themselves , so when it given offence is immediately taken at how one spoke, when one spoke, what tone of voice etc., etc. rather than the issue at hand. · They are fault finders with everyone. · When they take offence they often retreat or go cold on the friendship and are not interested in dialogue or reconciliation. · They are unable to discern who are their true friends, hence never form deep relationships because whenever there are true friendships there will be honest open talk which they cannot face. · Often time expectations are not voiced but they expect you to know and read their minds and when you don’t, offence is taken. · In a church setting which is so much a part of my life I have seen this behavior pattern as very dangerous and detrimental to the unity and harmony in the church family. More so our prime enemy has a field day sowing thoughts of discord in our minds and before we know it we’ve got an issue with almost everyone or a lot of people and the poor souls are blissfully unaware of the offence they are supposed to have caused!! How silly is that? It is simple but not simplicistic. It takes a battle of the mind not to fall into that terrible trap. It takes courage to speak up and clear doubts. It takes humility to hear what the other person has to say and receive it well. It takes strength of character to have a sober judgment of oneself. It takes much grace and oodles of love and self sacrifice to appreciate others, to give them the benefit of the doubt, to let go petty issues. It takes fortitude to forgive even when one has been offended. It takes determination not to take offence even when it is given. WOW!!! How do I know this? Been there, done that. But this looks like a list for a super heroes or something. Yes if tried in one’s own strength. I need to remind myself that I can do all things through Christ who gives me strength and that when I am feeling weak, His power is perfected in me and then I am strengthened. I can win and lick this problem. I have a choice – to be offended or not. I also have a responsibility not to cause offense – that my speech is gentle and seasoned with salt, my behavior is loving and kind at all times and I will be quick to forgive and not harbor ill in my heart. My prayer is that I would be a channel of peace. Confession: I at times have not reacted in the best way when offended and have taken offense when there has been no need to. I too am learning not to react but initiate reconciliation and restoration and give the other party the benefit of the doubt. It’s not easy but when it’s done, it’s greatly rewarding. You win a friend back that you could have perhaps lost forever. Life is short. Let’s keep short accounts and be on the offensive about this offensive habit of taking offense! Why write songs when we have Matt Redman?